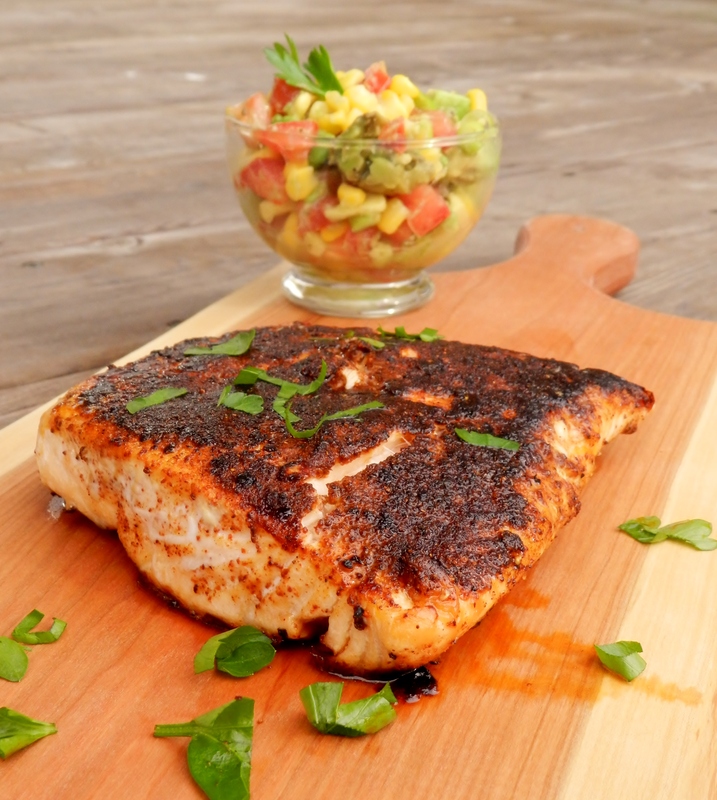 When it comes to food, the term “blackened” is not a descriptor you would typically want to use to describe your dish. 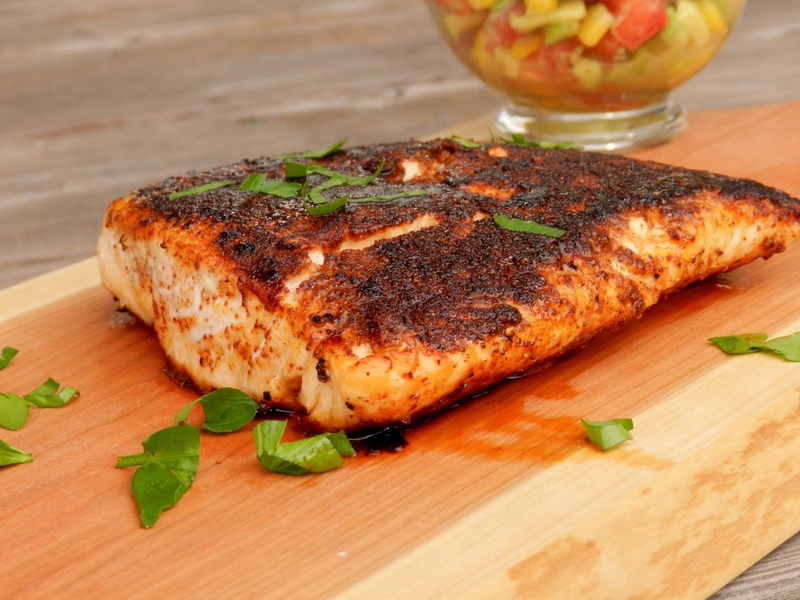 To us, anyways, the word blackened is kind of synonymous with other words like “burnt” or “charred”- doesn’t exactly get your mouth watering, does it? No, it sort of just leads us to think of another word… “inedible”. Think about it- blackened cookies, blackened toast, blackened pizza… suddenly you don’t feel well and you’re (cough, cough) “not hungry”, right? Yes, for the most part if your dish is blackened, you probably burnt it and it probably isn’t going to be very, well… sapid. (There. We tried using it and we were right- it just sounds weird.) But there is a time when the term blackened is a good thing. 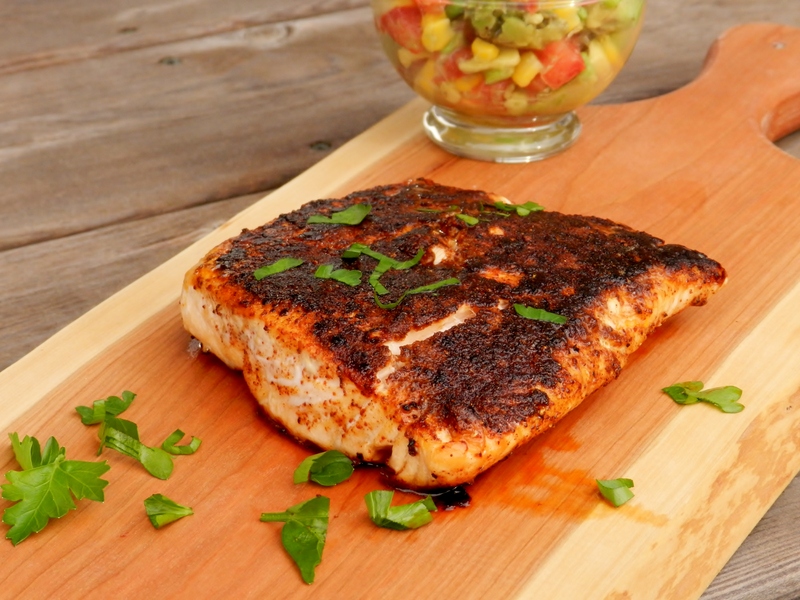 If you hear the word blackened in front of the word salmon, you can forget all of your preconceived notions of what you thought the word meant, erase the images swirling in your mind of charred, dried-out fish, and dive in fork-first! But in all seriousness, we may never eat salmon any other way ever again- it was that good. There are 2 simple steps to creating this mouth-watering dish, and only about 25 minutes until it is on your plate! 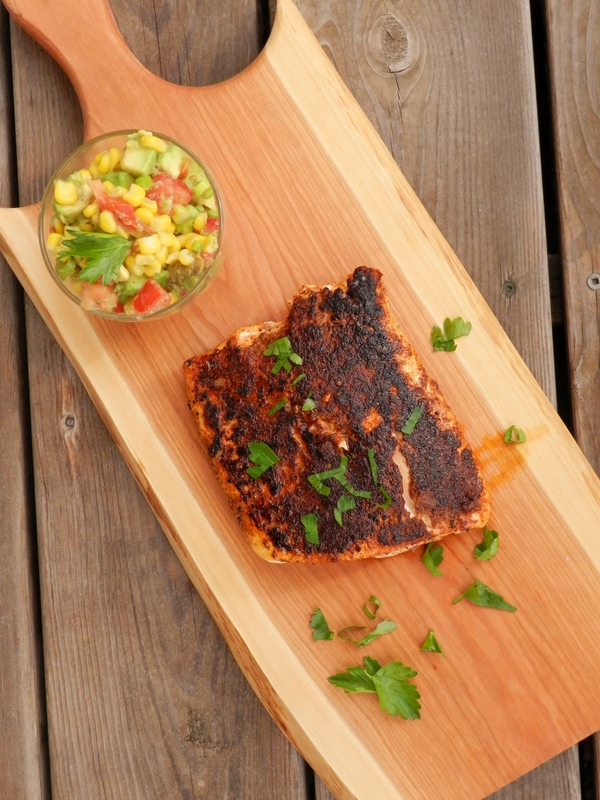 The secret to perfectly-done blackened salmon (aka-not burnt) is to sear it in the pan and then finish it off in the oven! That way you get a crispy outer-layer, but a flaky, succulent inside. Succulent. Now there’s a word we want to hear more of! Or how about delectable, exquisite, or tantalizing? Actually, if there was a word that combines all of those we’d have a dead-ringer! In a small dish, combine all the spices. 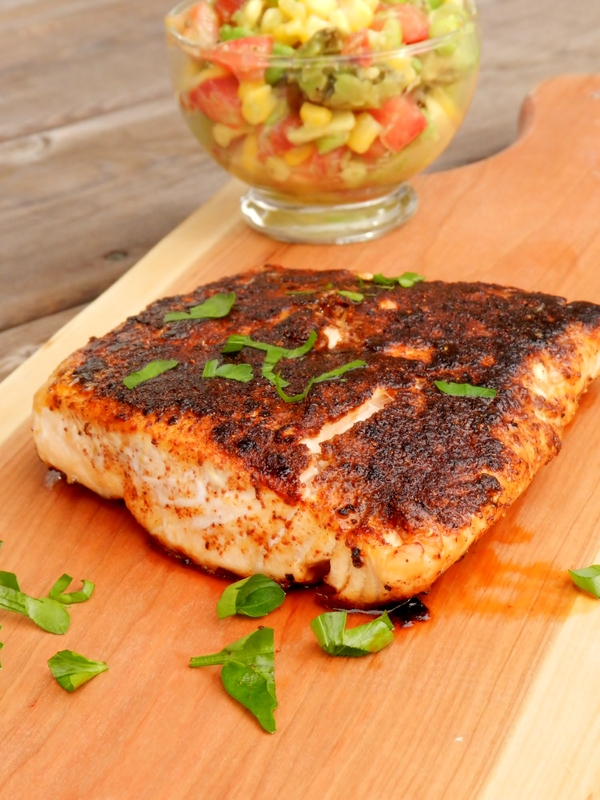 Generously coat both sides of the salmon with the spices and gently rub into the flesh. Heat the olive oil in a medium-sized pan over medium-high heat. Once the pan is hot, place the salmon in the pan. Cook for 2-3 minutes, or until the spices are blackened, then flip and cook for another 2-3 minutes to blacken the other side. Line a baking sheet with parchment paper and move fish from the pan onto the baking sheet. Bake in the centre of the oven for another 10-15 minutes, or until the salmon is no longer dark pink in the middle and flakes easily with a fork. Serve with avocado-corn salsa (recipe below). Combine all ingredients in a small dish and serve. 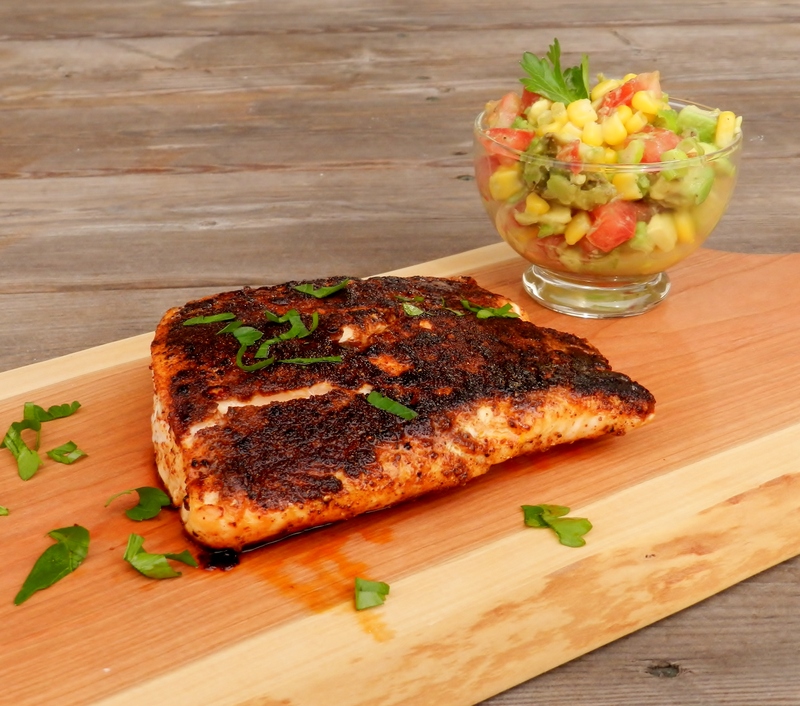 Posted in Uncategorized and tagged 2-step salmon, avocado, avocado salsa, avocado-corn salsa, black pepper, blackened, blackened fish, blackened salmon, cayenne pepper, chili powder, corn, corn salsa, cumin, dinner, food, garlic, healthy, healthy fats, mouth watering, oven-baked, oven-baked fish, pan-sear, pan-seared fish, paprika, salmon, salsa, sapid, spices, summer, tomato, twosaucysisters. Bookmark the permalink. A couple of months back, Linsday from Pinch of Yum posted about her favourite lentil recipes, which were all curry (or curry-esque) recipes. 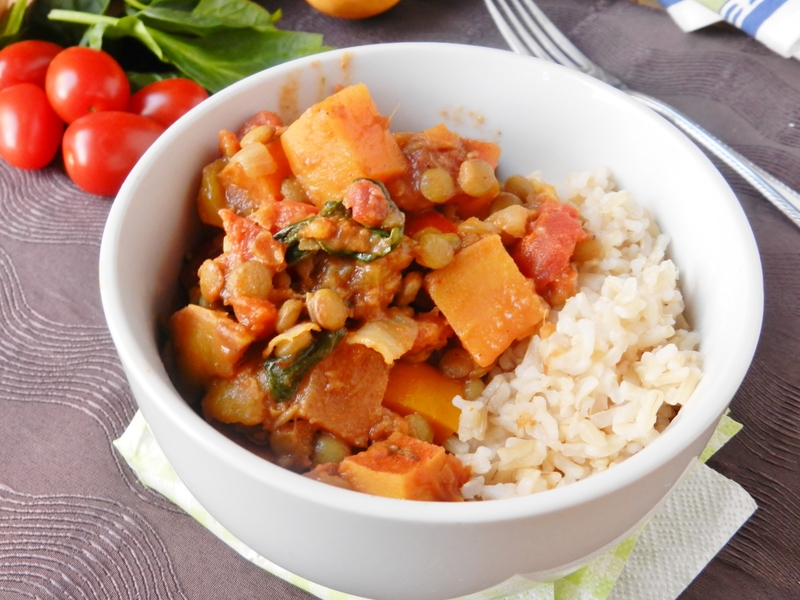 We love curry and lentils, so we thought that we would give one of her recipes a try. The problem is, we couldn’t decide which of the 6 recipes we wanted to make, so naturally, we made them all! Every Monday for 6 weeks we made one of her lentil recipes when we got home from practice, a day we dubbed to be “Curry Monday”. Of course, eventually we had made them all, so what were we to do? Make our own curry, obviously! We’ve made curry plenty of times before, and they we always good, but we found that there was something missing… they didn’t send us to our foodie happy place, nothing so special that we would write down the recipe so we could make it again. Until now! 1. Curry Paste – we currently have a jar of yellow (though it looks red to us!) curry paste, and we’re telling you this stuff is curry-making magic! It may seem expensive, but all you need is a small amount to really take your curry to a new level. 2. We added less spices. I know it seems weird – less spices to a curry dish? But they are supposed to be super-duper spice-filled! We know, that’s what we thought too, but the thing is, curry spices are very strong, and so if you add too many, you just end up with a slightly bitter bowl of curry. Yuck! 3. Added the spices sooner. In the past, we’ve always added the spices much later in the cooking process for fear of the spices losing their flavour. However, while that may be the case with more delicate herbs, not so much with these spices! This time, we added them right off the bat when we were cooking the onions. Cooking or “toasting” your curry spices doesn’t cook off flavour, but more the bitter compounds and flavours that these spices have in their raw state. This particular curry also has a special ingredient, one we don’t normally have in the fridge but just happened to be on sale this week. We don’t know if it’s mango season somewhere, but if it is, we are very glad it is. 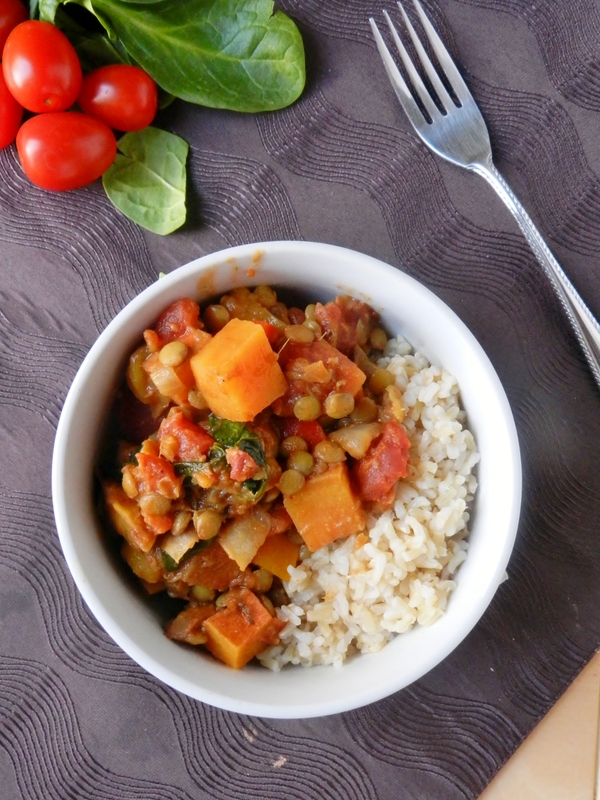 A full-flavoured, sweet potato and lentil curry with hints of sweetness from the chunks of mango: Dinner time done right! Put lentils and water into a pot and bring to a boil. Reduce to a simmer and cook for 25min. Cook sweet potato in the microwave until soft, about 5 min. Heat oil over medium heat in a large sauce pan. Add onions, garam masala, curry powder, cumin, turmeric, nutmeg and curry paste, and cook until translucent. Add the ginger, garlic and peppers and cook for another 2-3min. 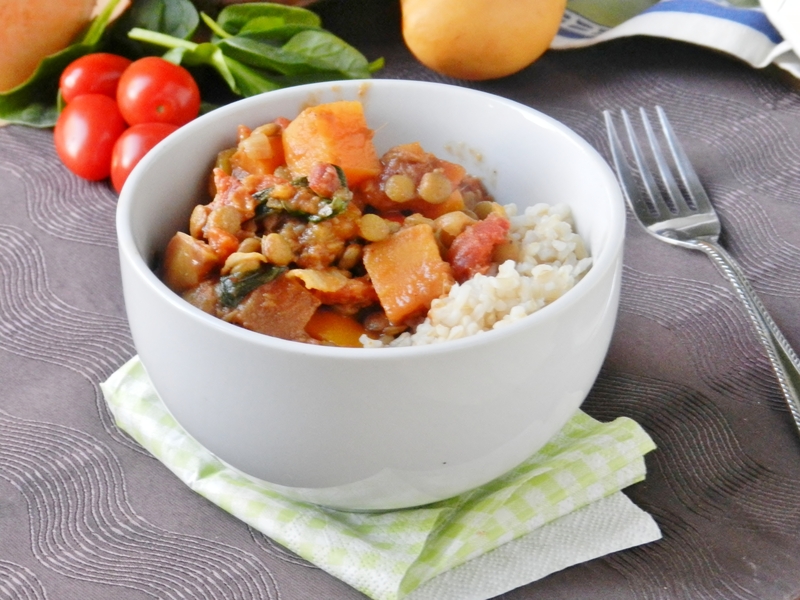 Stir in tomatoes, mango, cooked sweet potato and spinach and cook for another 2-3min, until spinach has wilted. 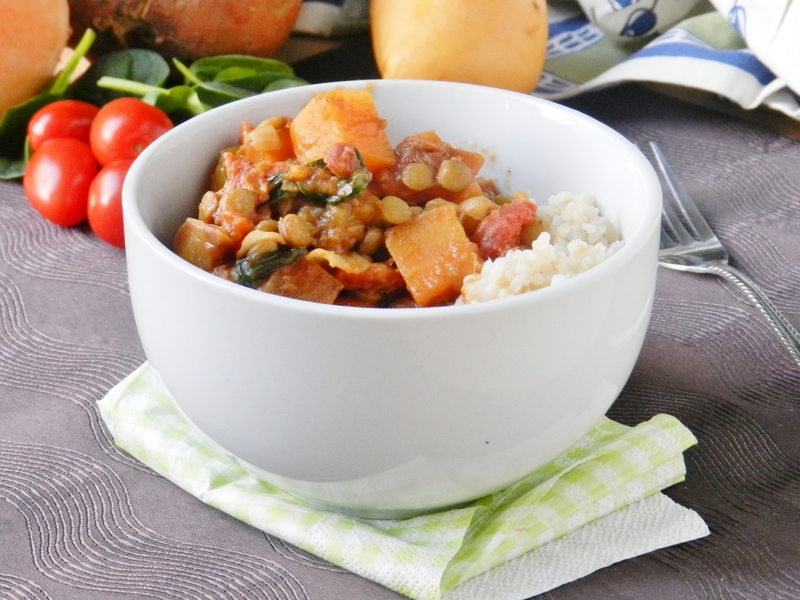 Turn off the heat and stir in coconut milk and cooked lentils and mix until fully combined. Add salt and pepper and serve over rice of your choice. Does anyone else have any tips or tricks for when they make curry? Posted in Uncategorized and tagged cumin, curry, curry paste, curry powder, curry recipes, delicate herbs, dinner, easy, food, garam masala, gluten free, healthy, lentil recipes, lentils, low fat, low sodium, mango, peppers, pinch of yum, recipe, spices, spinach, sweet potato, tomatoes, turmeric, Two Saucy Sisters, twosaucysisters, vegan, vegetarian, yellow curry paste. Bookmark the permalink. I am not a crazy red meat person. I enjoy a good steak on occasion, and am learning to appreciate more and more the uniqueness of bison and elk, but it’s not something I would typically order at a restaurant or really ever make at home. Once or twice in the summer, tops. But there is one way in which I crave beef, and I’m talking mouth watering, day dreaming, nothing else will satisfy it. I adore them! There are so many things you can do with burgers, so many topping options, bun options, flavours, cheese or no cheese- the list is endless! With summer now upon us, and Food Buzz’s Flavour of the Month being burgers, Brit and I decided we had better get to burger making! We didn’t, however, want to make an ordinary, ‘normal’ flavoured burger (though those are delicious! ), we wanted to be a bit more creative. 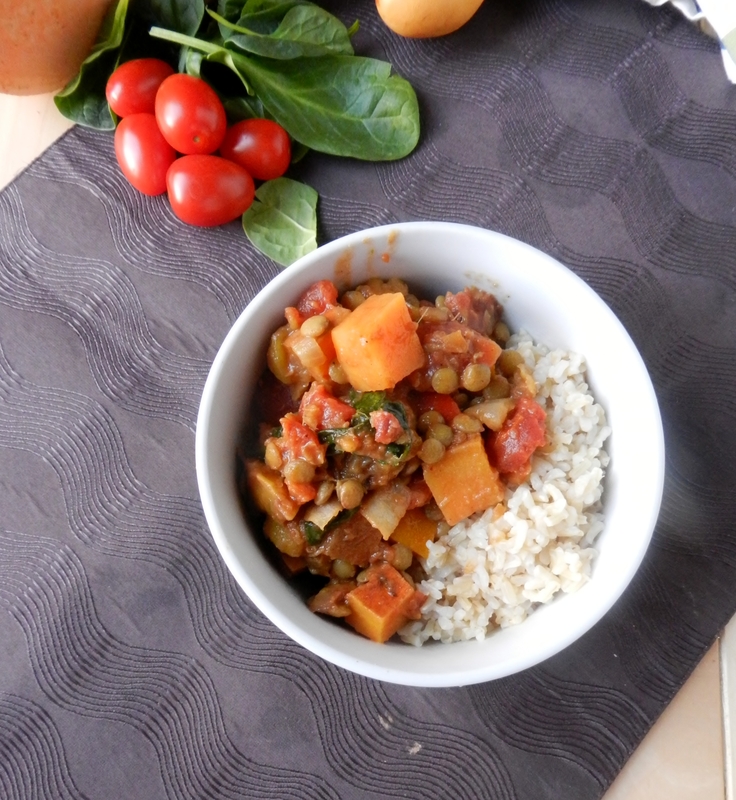 After turning over a few ideas, we settled on and East-indian/ Trinidad and Tobago influence – Curry! And you know what? It was a damn good idea! They were so juicy and loaded with flavour! In the past, we have struggled with creating a recipe in which the patties would actually hold together when put on the BBQ, but we came up with a sure-fire method that will guarantee non-crumbly burger! The trick? Whipping half your beef mixture around in the food processor – it turns into a “glue” as my dad so aptly named it, but by adding the other half in manually afterwards keeps that same delicious burger texture! 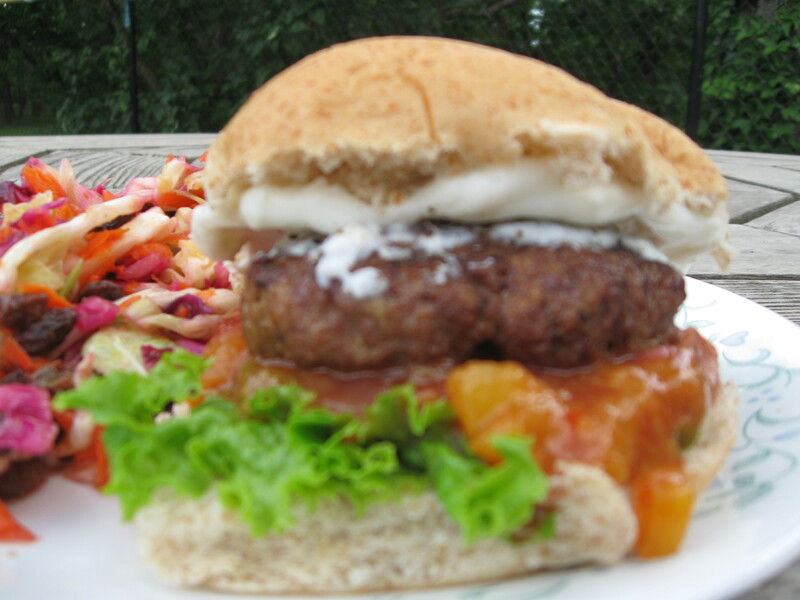 Of course, one can’t simply throw any old toppings on a curry-infused beef patty and call it a burger! We knew to make this a winner, we had to put together something that would compliment the burger while not taking away from the flavour of the burger itself. We decided on two: A savoury/fruity chutney (fruit in a savoury dish=best!) and a coconut-lime yogurt spread. Finish off with a crisp leaf or two of lettuce and darlin’, you’ve got yourself a home-run! *The chutney you will definitely want to make ahead, as it takes a couple hours and has to chill afterwards, as well. There are a few different methods that can be used to make it, but each still takes time to allow the flavours to fully develop. And with that I leave you with not one, not two, but THREE recipes! Go crazy! Put one pound of the beef in the food processor along with 1/4 c. of the bread crumbs, yogurt, onion, garlic and spices. Blend until a smooth, mashed-potato like texture. Transfer to large bowl and mix remaining beef and bread crumbs. Shape into patties, 4oz each. Grill on low to medium heat, flipping occasionally, until burgers are cooked through (71 C/160 F). 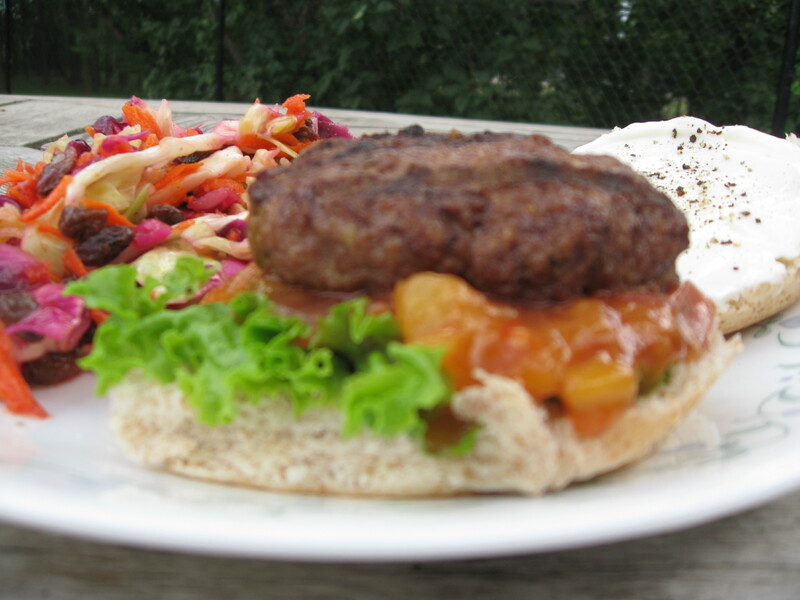 Take you whole grain bun, start with lettuce on the bottom, followed by chutney (recipe below) and the burger placed on top. 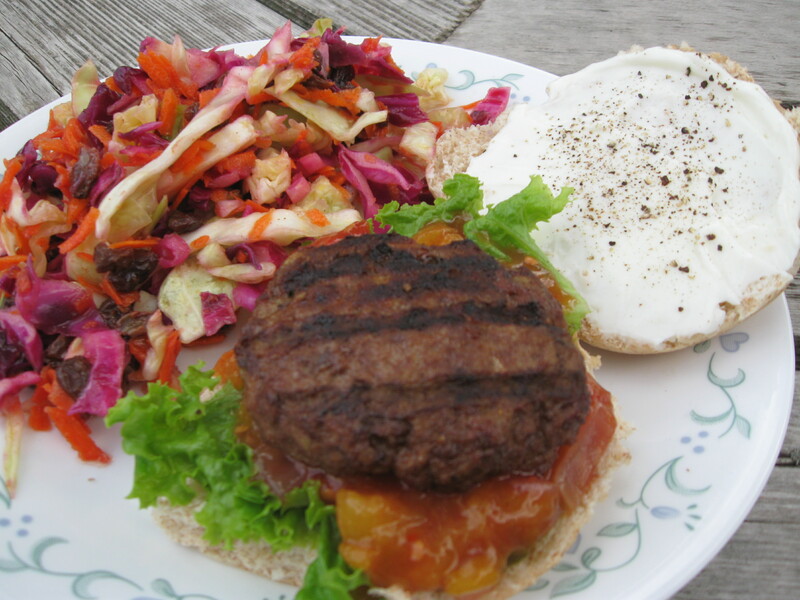 On the top half of the bun, spread yogurt (recipe also below!). Bread Maker Method: If you have a bread maker, simply put all the ingredients into the machene, select the “preserves” setting and let er’ go! Once finish, transfer to a container and allow to chill in the fridge for at least an hour. Stove-top Method: Combine all ingredients in a pot, bring to a boil, then reduce to a simmer forone hour. Transfer to another container and allow to chill in the fridge for at least an hour. Slow-cooker Method: Combine all ingredients in slow cooker and cook on high for one hour or so, then transfer to another container and allow to cool in the fridge for at least an hour. What’s your favourite burger combination? Posted in Uncategorized and tagged BBQ, beef, bread crumbs, burger, cayenne, chutney, cinnamon, coconut, cumin, curry, curry powder, garlic, greek yogurt, grilling, gringer, healthy, honey, indian, lime, mustard, onion, patty, peach, salsa, savoury, summer, sweet, tomato, trinidad, turmeric. Bookmark the permalink.